I have to admit this is not a film that I watch over and over. This is only the third time seeing it. It’s not a film that I overly enjoy or talk about. Some will find this film more appealing than others, but this is just one of those films that I really have to say, I don’t care that much for. This review is for the film and product. So I will mainly speak of the product. The product has no flaw. The beautiful amazing transfer of the film onto Blu-ray is an excellent example of creating a new outlet for this film. American Buffalo has not looked any better. Twilight Time Blu-ray has crafted a product that stands out in vibrant colors, through an amazing transfer, and the ultimate sound quality is utterly brilliant. This is a dark comedy, drama written by one the greatest writers of film and plays of all time. David Mamet is a master at crafting a story that actors can thoroughly become the characters. His stories, and utter mastery through dialogue, and playing off each other, as the chemistry flourishes on screen, is an art form that very few film/play writers have. Mamet has the ability to create dynamic dialogue, and story. From film masterpieces like 1991’s Homicide, 1992’s Glengarry Glen Ross, the much underrated 1992’s Hoffa, and the much underappreciated 2005’s Edmond, among many others. Mamet is a word god. 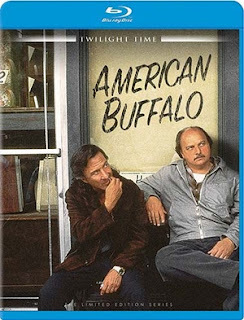 And American Buffalo showcases that brilliance in many ways. American Buffalo is from the stage play also written by Mamet and I feel in my personal view, probably should have stayed there. But I want to make something clear, some like this movie, and some don’t. Either way you look at it, it has the beauty and mastery of Mamet all over it. The film is what it is, simple and most of all clichéd in many ways. The movie lacks a lot in the action, or anything taking place, the film seems long winded. The movie has all the wonderful dialogue and that hypnotic reality that Mamet uses through his words, or structure of script. The plot is very simple. You have basically three characters, Donny, Teach and Bobby. Donny runs a junk shop. Bobby and Teach spends most of the day at the Junk shop. Teach starts coming up with a plain about robbing a home that supposed to have a safe filled with rare coins. That is the plot of the story and everything else happens around this plot. Something that stands out about this is the flawless cinematography and music. The cinematography by Richard Crudo stands out. He adds a run down, decay style yet cinematic storytelling in imagery to this film. That one thing that I feel really works for this movie is the sets or locations filmed. They give a down to earth, personal reality to average everyday life. The cast is brilliant. The amazing one of a kind Dustin Hoffman needs no introduction to the acting world. Hoffman has always graced cinema with total mastery, from my personal favorites like, Midnight Cowboy, Straw Dogs, Marathon Man, Hook, and Lenny which Twilight Time Blu-ray has released, you can read my review for it here: MY REVIEW . Also starring someone I have always felt never got the fandom or praise he deserved, and that’s Dennis Franz. Franz is an amazing performer, and the role of Don in American Buffalo is no different. I also loved Sean Nelson as Bob. Nelson brought a freshness to the role, and gave a younger side to the heavy laced plot. Nothing wrong in this department. It is beautiful both in image and sound. Isolated music track. Awesome special feature due to the wonderful music by Thomas Newman. Newman is truly a wonderful musician that has worked on some of the great films in cinema history, The Lost Boys, Fried Green Tomatoes, The Shawshank Redemption, American Beauty, Erin Brockovich, In the Bedroom, The Help and so many others. His style as musician and composer is something that truly stands out in the films that he graces with his talent. Audio Commentary with Film Historians Julie Kirgo and Nick Redman. A great listen for any fan of cinema. Both Kirgo and Redman are true cinema loving masters. Anytime they do these commentaries they showcase the importance of cinema. Insert Booklet by Film Historian Julie Kirgo, which I always state is a wonderful added feature to these Blu-ray releases. If you have never seen it, it’s worth a watch, if you wish to own it, this Blu-ray is the only way to go. A nice, beautiful, vibrant transfer with excellent audio. Highly recommend this blu-ray.